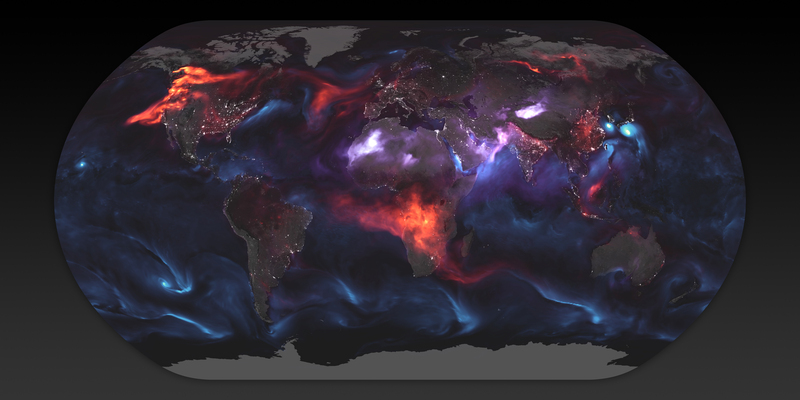 Aerosols are very small particles of matter in the air suspended by winds and air currents. The haze they cause can reduce visibility and redden sunrises and sunsets. The particles are much smaller than grains of sand. 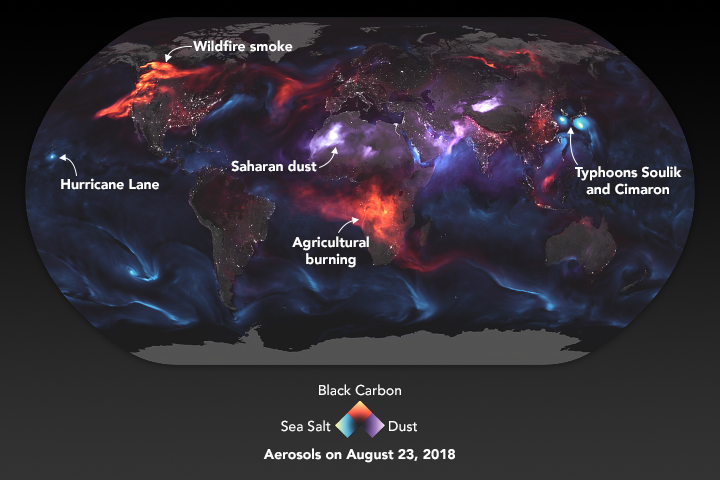 Common types are carbon from fires, wind blown dust from deserts, and salt from winds at the ocean surface. The map below is a snapshot from 23 August 2018 showing where these three types were observed globally by satellite sensors. Color coding makes them easy to identify. 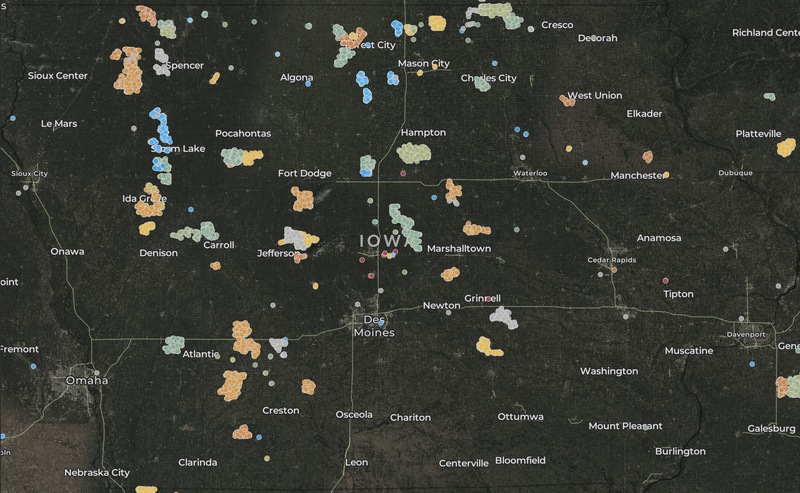 A much larger version of this map is available at this link. The download allows you to zoom in on any of the regions shown. A previous aerosol post is here. Booster Rockets are big, heavy, and expensive components essential to launching vehicles into space. 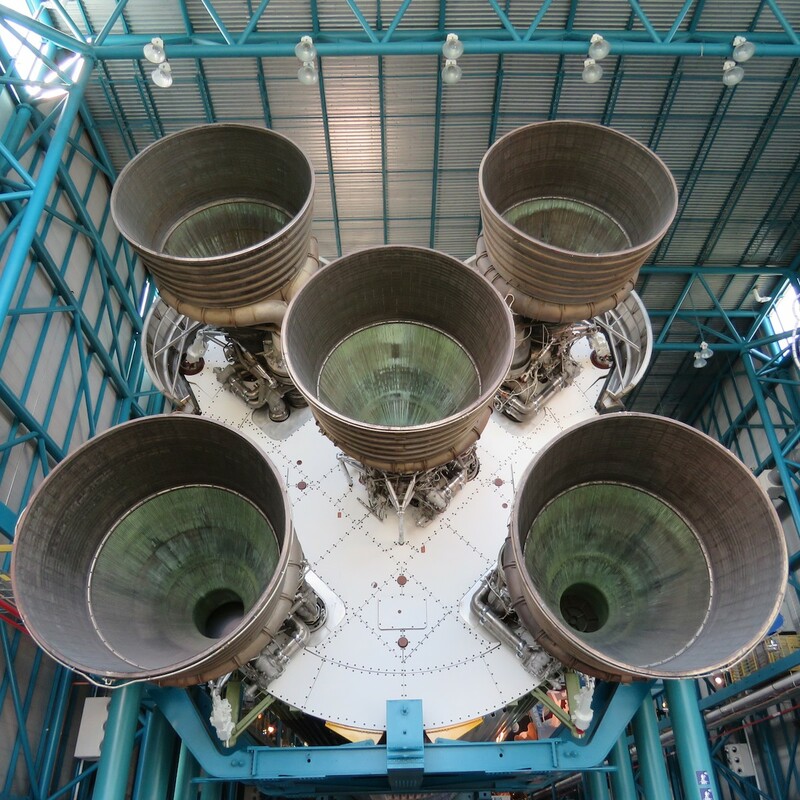 The 12 ft diameter nozzles of the Saturn V booster from the Apollo era developed thrust of 7.5 million pounds capable of lifting the 6 million pound fueled rocket into orbit. Those boosters were not reused after they did their work and fell into the Atlantic Ocean. Cost saving is important, as are safety and reliability. Private companies are involved in the development of reusable booster rockets. Zooniverse is a citizen science network. Hundreds of thousands of volunteers worldwide who take part in science projects online. I participate in several and wrote about Zooniverse in a previous post. 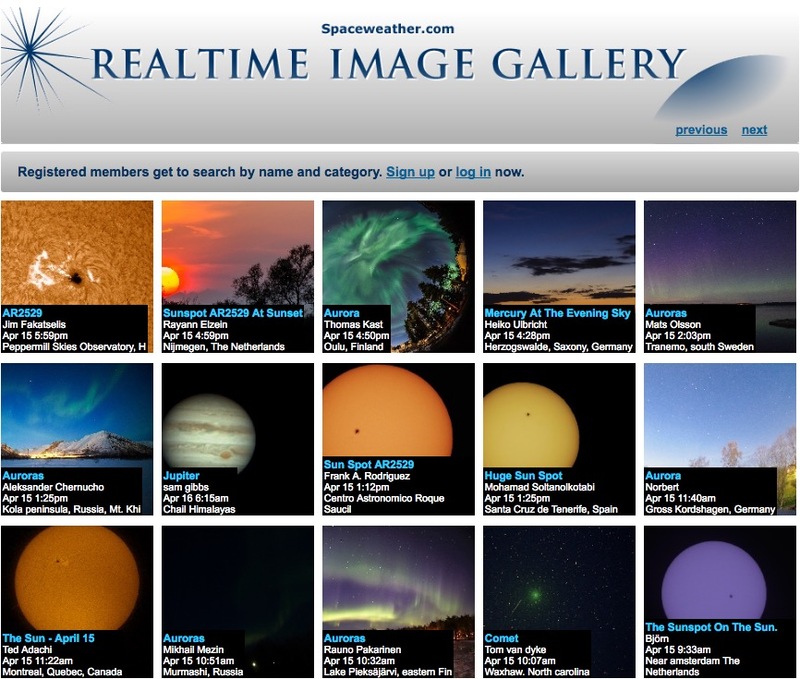 Researchers invite volunteers to take part in many types of projects from astronomy to zoology. Recent hurricanes in the Caribbean islands caused much loss of life and damage to property and ecosystems. Zooniverse volunteers were asked to help relief efforts by examining satellite images of the islands before and after the hurricanes. By comparing before-after images of the same places, structural damages, flooding, road blockage, and temporary housing were assessed. Color coded maps were made from the assessments showing the places most in need of relief efforts. Rapid response was extremely important. 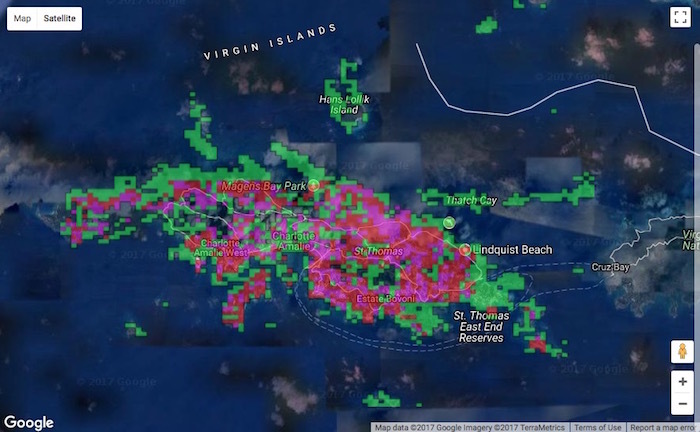 Here is an example of one of those ‘heat maps’ of the island of St. Thomas. Red and purple show the greatest need for help. The first 30 seconds of the Apollo 11 launch which transported astronauts to the first Moon landing. It is an awesome display of power and energy. Best viewed full screen on a big monitor. SpaceX, the private rocket launching company owned by Elon Musk, has had successes lately with commercial satellite launches. On 1 May 2017, they launched the military satellite NROL-76 from historic Launch Complex 39A at the Kennedy Space Center in Florida. Another major accomplishment by SpaceX is the successful landings and re-use of the stage 1 booster of the Falcon 9 rocket. This has never been done before, not even by NASA. The way I see it, that story deserves some explanation. Watch this compilation of clips from the most recent booster landing, their 4th. The landing takes place on an unused pad not far from launch complex 39A a short distance up the coast. I wondered what flight path the stage 1 booster took to allow it to return back to this spot near the launch site. Most of its fuel had been used to get it and the stage 2 payload to high altitude, far downrange, and going very fast. The flight needed to be very efficient.